Night People is a story revolving around a young American GI's kidnapping in post-World War II West Berlin by Soviets. They kidnap him in hopes of exchanging him for two ex-Nazis who double-crossed the Germans during the war, and are now in hiding in West Berlin. 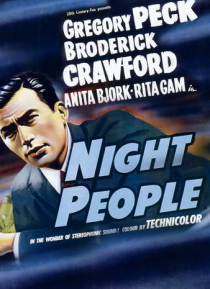 A CIA officer stationed in West Berlin, Col. Van Dyke (Gregory Peck), is charged with handling the crisis. The American GI's father is a… very powerful businessman, Charles Leatherby, who flies to West Germany to pressure for the safe release of his son.